"Moist, luscious, and delicious. 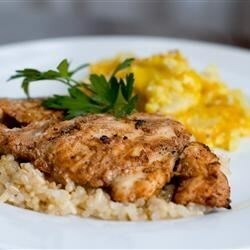 Just the right blend of spices make this chicken dish one of my most-requested. Great hot or cold. If using thighs with skin, you can put over direct medium heat for the last few minutes to crisp skin."